Sorry for the late notice, however I just received this information today. On Monday, October 29th, there will be a public meeting at Clermont Christian Church located 9204 Crawfordsville Road from 5:30 p.m. – 6:30 p.m. 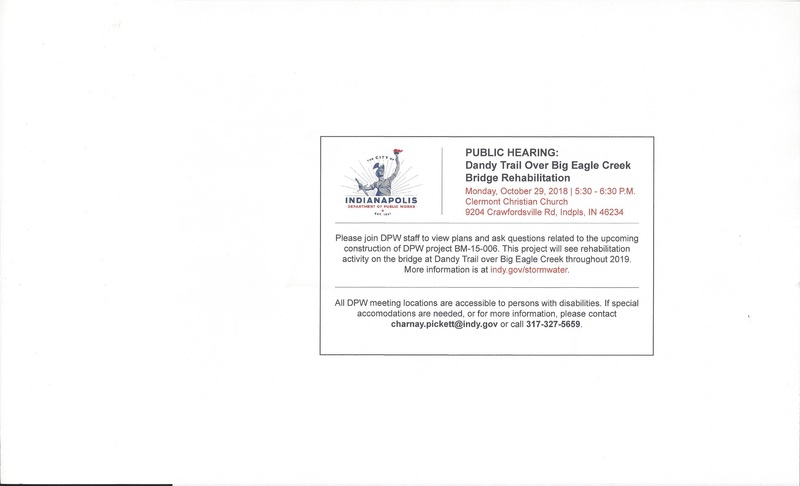 This is in order to view the plans and ask questions about the rehabilitation of the bridge over Big Eagle Creek on Dandy Trail that will be taking place in 2019 (this is the bridge north of Crawfordsville Road and south of I – 74). While is is something that we have wanted and needed for a long time, there are things all of us need to know. A lot of you travel this way every day or at least on a regular basis. There are quite a few neighborhoods that will be impacted in various ways. It will change a lot of traffic patterns for people – and will cause a lot more traffic on other streets in our district as we are very limited to our north/south streets. It will also impact our east/west streets as traffic will not be able to go through on Dandy Trail between 34th Street and Crawfordsville Road. This is not just going to affect the immediate area, but most of us outside of I – 465 and probably High School Road. I want to encourage as many of you as possible to attend this meeting and learn more. This is a great opportunity to ask questions you may have about this project as well as to look over the plans. The attached card (which some of you who live close by the bridge may have received in the mail) gives more information. PLEASE share this information with others in the area or those who rely on using this bridge. I would like to encourage all of my HOA’s to get this information out to their homeowners. While all of you are receiving this from me – my email list is limited to those of you who have requested being on it. Please help DPW and me spread the word to your friends and neighbors. Hope to see many of you on Monday!